We’d love your help. 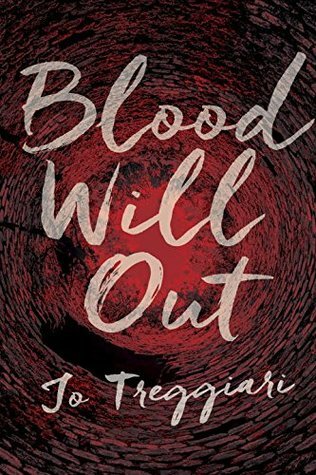 Let us know what’s wrong with this preview of Blood Will Out by Jo Treggiari. Until now, Ari Sullivan is alive—for now. To ask other readers questions about Blood Will Out, please sign up. i don’t mean to sound nasty, but this is probably one of the worst books i’ve read in my entire life. it wasn’t an enjoyable read, that’s for sure. it was barely even entertaining, and for a supposed thriller, and the definition of the word ‘thriller’ in all its forms (a novel, play, or movie with an exciting plot, typically involving crime or espionage), this book was just a big old farce. i don’t even want to get into the actual plot because it was so beyond boring that i don’t even think it’s worth it. i truly, honestly, didn’t care who was the killer. i didn’t care about any of the characters who were getting killed, either. and everything was so inexplicably predictable. the murderer’s pov chapters were maybe the silver lining of this book but in the end the person who was actually the killer turned out to be somebody who was so intrinsically irrelevant to the story that i was actually furious for a second there. also HUGE TRIGGER WARNING FOR ANIMAL ABUSE !!!!!!! The animal torture and abuse part were just some of the biggest disappointment, hence I didn't finish reading this book. There's no outstanding character or part in the story that will awe readers, and the flow of the story is too dragging and quite common. Ari, the main character, is irksome and her point of view is too bland; the conversation between the characters is also quite annoying to read. I had high hopes before reading this because I was really intrigued by the synopsis; I even pushed The animal torture and abuse part were just some of the biggest disappointment, hence I didn't finish reading this book. There's no outstanding character or part in the story that will awe readers, and the flow of the story is too dragging and quite common. Ari, the main character, is irksome and her point of view is too bland; the conversation between the characters is also quite annoying to read. This is your typical story about a girl who gets kidnapped and tries to run away from the killer, all the while the reader is trying to figure out who the killer actually is. There was one thought constantly running through my mind while reading this entire book, which was "when is the book going to end." I had too many problems with this story to even remotely enjoy it. 1) I know this book isn't going to be published until next year, but that doesn't mean you don't have to format the ebook properly for your early readers. I mean the formatting and structure was just AWFUL. 2) Most of the paragraphs weren't indented. 3) The "ha ha's" in parentheses in inner thought dialogue was so unsophisticated. 4) Sentences were randomly split in the middle, and started on the next line. This novel is supposed to a YA Suspense/Thriller. Books of this genre are supposed to make me think and wonder. They're supposed to keep me at the edge of my seat trying to discern who the killer it. But this author didn't make me feel any of those things. I didn't even care about discovering who the psychopath was due to me constantly counting down the pages until I was done. Not to mention how cheesy and repetitive the writing was. Alas, I did complete the book. But only because it wouldn't have been fair for to give this book a bad review without finishing it, especially because it hasn't been released yet. But god the book DRAGGED. It pulled me in at the beginning. The story starts with the protagonist gaining consciousness in the bottom of a cistern not knowing how she got there. But then I was half way through the book...AND SHE WAS STILL IN THE SAME SPOT. I kid you not. You spend half the book reading about the protagonist being stuck at the bottom of a well. The little amount of time she spent in consciousness shouldn't have taken up 50% of the story. There's only so many different ways you could describe a character feeling cold, scared, and alone. Honestly, this story had good potential. I know there are a lot of murder mystery books out there, but a good YA one is hard to find. And that's another thing. This is both YA and not YA. It's YA in the sense that the writing isn't sophisticated enough to be considered Adult. Its way too easy to read and understand. But it's also not YA because part of the story is told from a psychopath's point of view. And that POV is very descriptive in the killings, and the slicings, and the sadistic feelings the murderer experiences during vile actions. It's just...too descriptive to be considered young adult. If anything, it should be New Adult. Listen, I was not a fan of this book. This was seriously compared to Silence of the Lambs?? That’s a joke, right? Don’t talk to me or my son ever again. The worst thing about this book is the writing wasn’t bad! I wasn’t enthralled, persay, but I would say I was having quite an enjoyable time!! If this had been a contemporary about the adventures of Ari and Lynn it would have been fun! But noooooooo, the book had to ruin it with problematic content and a terrible and boring plot line. First off, the incredibly lackluster story. I told myself that if I got to chapter six and still, nothing had happened, I would stop reading. Guess what? literally nothing happened. Sure, we get flashbacks and back story, but I am not reading a horror/thriller novel to hear about romance and shopping. I am not reading a horror/thriller novel to hear backstory for the villain, no matter how scary it may be. I’m reading a horror/thriller novel for action, and tension but this book literally had none. Zero. Zip. Granted, I only read fifteen percent of the book, but if you are describing your thriller as “gripping” then there should be action starting on page twenty at the latest. There was also this like, weird conversation between Ari and Lynn in one of the flashbacks and I was like ???? “’You’re a girl, for Pete’s sake. You’re supposed to live for shopping. THAT DOESN’T MAKE ANY SENSE WHAT DOES THAT EVEN MEAN LOLLLLLLL Like seriously that is just, like, what? How does this contribute to anything? What does “the boring kind who’s boring” even mean?? If you’re going to give me a bunch of character info-dumping at the beginning of a book at least make it actually contribute to who they are as a person. I’m so. I don’t even know. Which is, like, not okay? I mean, the character is obviously a creep and a bad person and the book acknowledges that, but at the same time the book never specifically challenges the use of a slur, it’s more of a general “oh yeah he’s the worst what a jerk,” and I wish that the use of a gross slur hadn’t been in this book at all, or at least seen as specifically not okay. Why even use slurs? Why not just, like, not? I’m so done. But, also terrible is a little while later the same character says another crappy thing, but this time it’s transphobic. and I will say, again, that it is definitely established that the character is a creep and gross and a terrible human being, but the fact that this and the d-slur are never specifically challenged just doesn’t sit well with me, especially since it kind of came out of nowhere and my mind wasn’t prepared to deal with this kind of crap. Another thing that annoyed me in this book was the cultural appropriation. Listen, I’m not Japanese, but I am, like, 99.9% sure that white people aren’t supposed to wear kimonos. That’s cultural appropriation, buddy. And so why is Lynn purchasing what is described as a “tight kimono deal”? And planning to wear it to a dance? Wtf?? oh boy so this made me mad!! This book describes the killer (won’t say who for spoilers) as “insane” and “psychotic” and I’m honestly, like, so annoyed. Why in every single thriller novel is the murderer mentally ill? This is also true in movies. I’m so sick of thrillers demonizing mentally ill people, especially when mentally ill people are actually more likely to be VICTIMS of violence, rather than perpetrators. This pisses me off to no extent. I can’t even form coherent thoughts. In conclusion, sit. this. one. out. This was boring and crappy and problematic and not fun. I’m going to go watch Silence of the Lambs now. First off I wanted to say I think the author did a really good job with the actual writing. I didn't see any grammar issues, and thought it was a good start. However, I think there were a few things that could have been done to really improve the writing overall. I wanted to start with the fact that I didn't like the animal slaughter. It was really hard for me to read. I was cringing half the book mainly because of this. You can't really skip over it either because it gives the characters their personalities? I don't know I guess thats what you call it. Another thing I didn't like, and maybe this was just personally, was I just didn't find anything very interesting. It was a book I had to force myself through. I had such high hopes when I read this last year and I feel let down. BLOOD WILL OUT is one hot mess. Early on the italicized perp recalls killing and blood letting a piglet at age nine, which automatically turned me off to the book. I never, ever need to hear details of an animal’s death. I’m okay reading about people murdered in graphic detail (though I might skim if it’s too bloody), but leave the animals alone. Chapters alternate from the perspective of the perp and Ari, the teen in the cistern and from present to past in random fashion. Ari in the cistern was full of tension and pulse. I tuned out her backstory because it was bland and I just didn’t care. The kidnapper’s history, though one dimensional, interested me, but I could have done without the animal parts. This. Is. One. Creepy. Book. First class horror at its best. You need to have thicker skin to live through this unphased. I had to take constant breaks and slip a few episodes of FRIENDS or 3RD ROCK FROM THE SUN for some laughs in between. This book really is like SILENCE OF THE LAMBS for YA, I even think it's better than the movie because it's a book and everything seems so much closer and more realistic and you spend so much more time in a book than in a movie. Also. DON'T READ THIS AT NIGHT, PEOP This. Is. One. Creepy. Book. Also. DON'T READ THIS AT NIGHT, PEOPLE! Ari wakes up in darkness. She is trapped at the bottom of a well with no memory of the events leading up to how she got there. She is running out of time before she dehydrates and she must fight for her life to survive. The only thing keeping her alive is thinking about her friend Lynn and the fact that she must also be searching for Ari. Ari will do whatever it takes to survive and find the monster who did this to her even if she can’t remember how she got there in the first place. I really like the concept of being thrown into a novel with the main character trapped in a well. I’ve read stories with similar premises with women trapped in rooms (Comfort Food and Stolen: A Letter to My Captor), but I was incredibly disappointed by this YA thriller. The writing doesn’t set the tone for suspense and impending doom. In fact, the well is left behind quite early into the story (before the 50% mark) and it quickly becomes a confusing mess of Ari trying to stumble around and guess who kidnapped her. The stakes do get raised, but not enough to feel like I had to keep reading. In fact, I found this book really easy to put down and it was lackluster in the thriller department. A good thriller heavily relies on the writing and I don’t think Treggiari delivered a writing style that captured me and made feel sucked into the story. I couldn’t stand Ari. She makes for a mediocre heroine and she wasn’t very likable. I felt like she was so run of the mill and mediocre. Nothing about her stood out and really made me root for her. Her conversations with people felt fake and I didn’t really buy the naivety and innocent ploy that Treggiari was trying to convey. Also, she is a terrible investigator and proves that most suspense novels are only suspenseful because people who don’t watch the Investigative Discovery network make the wrong move and try to be like Nancy Drew. It never works out well, but in this case, it felt very juvenile and campy. The Villain- I did enjoy the chapters detailing and chronicling how the psychopath has gotten to this point, but the reveal made this less enjoyable. This is where my problem lays with this novel. At first, I was thinking this was a relatively okay novel and then we run into a ridiculous reveal. This villain was so out of left field that when the character’s name was revealed to be coming out of the trees with a killer look in their eyes, I thought to myself, “WHO?” It was out of nowhere and it kind of doesn’t make sense. I get that the events all point to that direction, but come on, that character was only mentioned one time at the very beginning and it wasn’t even brilliantly done. It felt like a twist to be a twist, but no thought went into it. Lynn is Ari’s best friend and I found her to be insufferable. There were a lot of comments that she made that just felt incredibly rude and condescending towards others. She would say something cruel and Ari would trail along her continuing to perpetuate bad habits and when she would tell Lynn something she would get shot down with a cruel remark about being stupid and innocent. I just couldn’t really root for their friendship because it felt a little toxic. Also, one of Ari’s potential serial killer suspects suddenly saves the day and becomes friends with them in the end and it is so random and weird. Overall, Blood Will Out isn’t a horrible novel, but it wasn’t what I thought it was going to be. I’m disappointed in the turn of events with the villain and I just feel like this novel tried to be a new hit YA thriller because that’s something the market is searching for, but it didn’t work for me. I’m disappointed because I thought I was going to really enjoy this one, but I was also reading it alongside a Karin Slaughter novel and that woman can write suspense that shocks the reader. This was just disappointing for me. I do think readers who are less familiar with serial killers, crime, and thrillers will really enjoy this one and that’s the reader I would recommend this for if I was asked. Cover Thoughts: It’s creepy. I love the way that it looks as if you can't get out of a well. It was super annoying! It looks unprofessional and threw me off every time. Add to that the blatant spelling errors, and times there was no space between words and the whole book just appeared like it wasn't ready to be p Thank you to Netgalley and the publisher for the chance to read this book! It was super annoying! It looks unprofessional and threw me off every time. Add to that the blatant spelling errors, and times there was no space between words and the whole book just appeared like it wasn't ready to be published yet. Also the writing is clunky and repetitive, and I just generally didn't enjoy it. I will say i was surprised at the 'serial' killer, but more because the writing wasn't leading me any where, let alone towards understanding. i got through chapter two, and i just couldn't handle it. sorry, y'all, but someone who enjoyed killing their pet pig ain't gonna be someone i want to read about. Thank you Netgalley and Penguin Teen for the ARC! This book spoke to me at the beginning. It has a nice cover, an interesting synopsis, and a seemingly likeable narrator. That's... about it. I tried to like this book, I really did! It was just slow and unoriginal, and the writing wasn't good enough to make up for that. One of the major issues with this book is the characters- specifically, the main character. She had no original or intriguing ideas. Her POV was so bland that it was like reading a Thank you Netgalley and Penguin Teen for the ARC! One of the major issues with this book is the characters- specifically, the main character. She had no original or intriguing ideas. Her POV was so bland that it was like reading a news interview or some other detached-yet-opinionated writing segment. Not to mention that everyone behaved so unrealistically! I mean, this girl drives a car with a guy who's head was shot off in the passenger seat, and her parents don't even cry or anything when she gets home safe?! They were trying to get her to go to school like a week after she was kidnapped by an unknown perpetrator?! I think the most emotion the dad showed was when he yelled at the police officer interviewing Ari (our mc). I had hoped throughout the book that the writing would get better, that the story would take an interesting 360, but that never happened. The writing stayed the same: standard, if not a bit bland, with practically no world building. There was basically no atmosphere at all (somehow?). Treggiari had intended to craft an unreliable narrator in order to keep us readers guessing, but the writing wasn't good enough for her to pull that off. Ari's memories/recollections were just confusing and I often had no I idea what was really happening. This was made worse by ideas that were introduced yet not explained; I was so lost! On the very first page the word "she" is repeated around twenty thousand times, giving the impression that this was a mildly popular yet lightly edited fanfic. That theory is further supported by the unstructured paragraphs (what was up with that?) and writing level. Also, Ari was just dumb. She thought lesser of girls only because they were younger than her, but she had no reason to? She acted like being in the bottom of a well for eighteen hours allows you to see the secret of the universe. RELEASE DATE: JUNE 5TH, 2018. There are moments in a book reviewer life when it really gets to a difficult book to rate of. That's what happened to me with Blood Will Out by Jo Treggiari. The story is focused on Ari’s point of view -told in the third person- and another unknown’s point of view -told in the first one. Ari is a girl who goes to high school with her best friend, Lynn. Their town is safe, or at least they have always thought of it as that. What if they were wrong? Could really anyone be capable of something such terrible? √ I really liked the writing. It was evident that the author seriously knew how to write. Especially the first point of view style. That was amazing well written, and I usually don’t like the first person, so. √ The book became very captivating, after some pages. √ I enjoyed the killer’s character design. You could actually see why they did what they actually did. Also, their story was interesting to read. Often, even more interesting than Ari’s. √ You can get some seriously good friendship from this book. Ari and Lynn have a special connection and you can see that through the whole novel. ✘ Reread the second point of my likes list, it will help you connect this paragraph. So yeah, I said after “some” pages. The truth is, although the writing is so good, the whole book wasn’t that interesting all the time. I have truly thought of DNF it, but duty called. ✘ I would like if the author showed also others good relationships in the book, besides Ari and Lynn’s. It shouldn’t had to be a romance, but still. ✘ The plot twists were kind of predictable and they didn’t surprised me at all. Overall: the author does write well, but that’s the only reason I am giving this 3 stars rating. Otherwise, it would have been a 1 star one. So worth it or not? I would actually say no, if you are expecting some plot twisted and captivating thriller and yes, if you are expecting a book well written, but not a thriller. I DNFed this book a while back. Initially, I wasn't going to write a review on it for GR as it hurts me to have to give such a low rating to a book. I know authors work really hard to put these books out and it is so hard to write and so hard to take criticism for what you write. This being said, I have changed my mind and now feel like I need to say my bit on this book. *For the record, I altered the dates on the 'read' section so that it would not count towards my reading challenge. I didn't e I DNFed this book a while back. Initially, I wasn't going to write a review on it for GR as it hurts me to have to give such a low rating to a book. I know authors work really hard to put these books out and it is so hard to write and so hard to take criticism for what you write. This being said, I have changed my mind and now feel like I need to say my bit on this book. *For the record, I altered the dates on the 'read' section so that it would not count towards my reading challenge. I didn't even get 25% through so don't think it should count. The reason I stopped reading this one is that the pointless torture of animals is not something that I can read. I tried to muscle through by skimming over those sections but then I was missing entire portions of the books. Pretty much all of the 'psycho' character's chapters (as this book is told from two POVs - the victim and the perpetrator). Some books have this type of 'situation' once maybe twice in a book and it can easily be skimmed over as it is just one or two paragraphs. This didn't seem to be the case here. I'm highly disappointed because I feel like this story had so much potential, but the writing was poor, at best, and all the flashbacks were very confusing. Okay, so after finishing this book I had to take a little break to properly think about the twists and turns in it. Afterward I searched for other peoples opinions and was shocked by the bad response and misunderstanding of this book. „She wakes at the bottom of a cistern, confused, injured and alone, with only the shadowy recollection of a low-pitched voice and a gloved hand. No one can hear her screams. And the person who put her there is coming back. The killer is planning a gruesome masterpiece, a fairytale tableau of innocence and blood, meticulously designed. (I don’t want to tell you more about that specific topic, because if you hate hurt animal in books, please just don’t read this book.) For everyone else: A lot of mass murderers began with murdering and torturing animals so in my opinion it was just a research fact the author used for the benefit of the story. He understood me not at all. Bodily pain was nothing to me. I was made of nothing. I observed; I considered; I went to the dark, safe place in my head and I burrowed there like an animal. First, I need to get a few things off my chest. Such as, WTF KIND OF NAME IS STROUD BELLOWS? I'll take "overly unique/edgy early-2010's YA love interest names" for 200, please. Also not a fan of the title since it makes zero sense to me, but Stroud Bellows gets the award here. I really wasn't a fan of the beginning. Ari's chapters were banal and dull, full of teens doing typical teenstuff, like crushing and shopping and a whole bunch of things that felt misplaced in a thriller novel. Ari stayed in the cistern for a long time having these flashbacks, and the plot was going nowhere. The killer's chapters were more interesting, although disturbing. But about half way, the pace really started to pick up. So yeah, it's a tricky one to rate. It relies on the killer's psychopathy, there was problematic word usage, the beginning was bland, and the end didn't make total sense. Yet it was a weirdly compulsive read. Once Ari was out of the cistern, the story became addictive. It's nothing brilliant, certainly not worth comparing to Silence of the Lambs, but if you're a fan of the genre, definitely check it out. But seriously. Let's petition Jo Treggiari to change the name Stroud Bellows. Blood Will Out is an (upcoming) YA horror novel that begins with our main character, Ari, waking up at the bottom of somewhere fathomless, dark, with a head wound and in pain. Told in chapters that alternate between her perspective and that of a psychopathic killer, we witness Ari start to piece her memory back together, fight for her survival, and come face to face with the killer once more. She finds herself trying to solve the mystery of who the person is, robbed of her most immediate memorie Blood Will Out is an (upcoming) YA horror novel that begins with our main character, Ari, waking up at the bottom of somewhere fathomless, dark, with a head wound and in pain. Told in chapters that alternate between her perspective and that of a psychopathic killer, we witness Ari start to piece her memory back together, fight for her survival, and come face to face with the killer once more. She finds herself trying to solve the mystery of who the person is, robbed of her most immediate memories prior to finding herself at the bottom of the well, unheard by the adults who are supposed to listen to her - her parents, the police chief, even the medical professionals who urge her to go back to school and forget about it. On the one hand, the pacing is excellent. The story moves along extremely quickly, and it's definitely a page turner. The alternating chapters are effective, because all of the creep factor comes from the chapters told from the killer's perspective. Ari and her best friend, Lynn, make for excellent characters. Ari is soft and sensitive and finds her strength. Lynn is fiery and full of energy, and suuuper gay, which is fantastic. They're the bright stars in this novel, for sure. Treggiari also does a fantastic job of misleading the reader more than once. Every time I thought for sure I had sussed out who the killer was, I found myself very wrong indeed. The prose itself is also good - clear, with occasional strong pieces of description that really set the mood. Tregiarri creates atmosphere in an extremely compelling way. On the other hand, I found the dialogue a bit wooden, and the adult characters (excluding Lynn's mother) are frustrating. Although one might assume it could be realistic, the sheer amount of adults refusing to listen to a clear victim is staggering. While it's necessary for the plot, one wonders if the way the plot plays out is necessary given how many adults had to act obtuse in order to pull it off. I am admittedly not a reader of horror, so perhaps that made it a bit harder to suspend my disbelief. Review is also cross-posted at The Rave Library. When I first saw the blurb of this book, I thought, "Oh, god. A YA thriller about a cannibal character? FINALLY!" I mean, this book is dubbed as "Silence of the Lambs for Teens". Of course that picks up the interest because you'll find out if this book will level up the classic of "Silence of the Lambs" in storytelling and hoped that it will turned out to be good, as I am wary of comparing other popular works in writing book blurbs nowadays. But Review is also cross-posted at The Rave Library. But as soon as I have my copy, it turns out that - spoiler alert - there is no cannibal involved at all. What a bummer. But it makes up that there is a serial killer involved in this story, so it's a consolation, especially that serial killers has recently piqued my interest lately. And so, I expected it to be a good one. 1. I kind of dislike the book's premise. It sounds ridiculous, it gives a thought that it's going to be a cheesy romantic thriller due to its silly premise explanation, in which was my first thought so that's why I'm a bit hesitant to read it. 2. I noticed that the explanation of the serial killer's condition is very confusing. I mean, is that person actually has problems with color or what? You would guess that the person is gifted, but there's something that's off, so in short, I really don't get what it means. 3. As a cat lover, I'm very triggered at that particular scene that you have to dissect them at school. Isn't that illegal? I already experienced being triggered at dissecting frogs, but cats? WTF is this teacher thinking? And seriously, why did the author think of that? Just a trigger warning that there's an animal abuse here. 4. And lastly, the writing format. I know it's still a draft, but I can't help noticing the glaring errors while reading. The punctuation, the grammatical errors, and mostly, the time breaks between the present time and the flashbacks, in which have the most annoying faults in this book. Oh, and on top of that, it's "Allan" on Edgar Allan Poe, not "Allen". 1. I like how the book chapters alternates between Ari (Odd chapters) and the serial killer's (Even chapters) POVs. Though dragging at some parts, it's nice to know what is going on the killer's thoughts and backstory. 2. The characters. I like Ari. She starts of as a boring, shy meek girl that eventually became a paranoid, high-alert victim who wants justice, though I found her to be overreacting at early chapters. Lynn too, who also have an interesting personality on it's own. Her friendship with Ari is nicely fleshed out in the book. Also, there's Jesse, who I didn't know to be a pivotal voice in this book, so in the end, I like the characters. 3. The plot twist of the serial killer is really unexpected. It shows that not everyone you know is like that at you at face value. 4. The creepiness factor is shot up too high. You couldn't even guess who is the killer, the killer's motive is also pretty disturbing. In fact, the killer's motive is actually one of the most disturbing I've ever encountered in fiction, so yes, I found this part really unique. To cap it off, despite the plot is straight out of your typical teen slasher film, it's been an enjoyable ride that I checked this one out. Still bummed that there's no cannibals, though. Comparing this to "Silence of the Lambs" is really laughable, because it's nothing like that (and which is why I hate these kind of blurbs). But hey, if you want some creepy, thrilling fun, here you go. It's nothing special to commend for, but at least you're in for some crazy, bloody ride. The first half of the book describes how Ari Sullivan is trapped inside a cistern, not knowing how she got there. There are a lot of flashbacks providing glimpses into her life, her friends, and the time 'before'. Then suddenly, Ari manages to escape her creepy prison and step by step she is able to recount the events that lead to her imprisonment, realizing almost too late who is the abductor, and that the game has only just begun... Also interwoven with Ari's story are chapters telling the bac The first half of the book describes how Ari Sullivan is trapped inside a cistern, not knowing how she got there. There are a lot of flashbacks providing glimpses into her life, her friends, and the time 'before'. Then suddenly, Ari manages to escape her creepy prison and step by step she is able to recount the events that lead to her imprisonment, realizing almost too late who is the abductor, and that the game has only just begun... Also interwoven with Ari's story are chapters telling the background story of her abductor, telling how he/she came to be the person he/she is now. After the usual misleads, Ari faces her tormentor in a final showdown. I got to say I enjoyed the first half of the story, where Ari was trapped at the bottom of the cistern, trying to piece together what happened but still failing. Only after she leaves her prison things start getting downhill. Her first suspect was too obvious to be true, and the second best guess was also a diversion. However, I was disappointed when I found out who was behind it all. I hate when the reader has almost no chance to pieced it together on her own, and the culprit suddenly appears like a jack-in-the-box. I often wonder about the YA category, which did not really exist at the time I was a teenager. What makes a YA novel different from a 'normal' novel? I often thought the level of brutality and gore should be lower, but that is not really the case here (not that I mind). Maybe the main characters should be young adults, to make it easier to identify with? That seems not enough to justify its own category, and there are great not-YA novels out there featuring teenagers. So what then is the point? I definitely can't find one here, other than the writing was mediocre at best, the plot wasn't really original if you've read your share of thrillers. Most of all, the outcome was disappointing because I missed a more comprehensible trace. Sadly, this is another example of a YA novel that makes me believe YA might just be a substitute for less ambitious books. However, as I said before I did enjoy the first part, which earns this book a second star. I hate to give this book another low rating, but it just wasn’t that great. And I think the author could definitely learn from the mistakes of Blood Will Out and write a really great second novel (maybe not in the thriller genre). First off, the formatting is horrible. There are sentences with weird spacing, and still several grammatical errors, but I can look past that. What I can’t look past is how boring the book is. Especially in the beginning. The main character Ari, is trapped in a cistern I hate to give this book another low rating, but it just wasn’t that great. And I think the author could definitely learn from the mistakes of Blood Will Out and write a really great second novel (maybe not in the thriller genre). What I can’t look past is how boring the book is. Especially in the beginning. The main character Ari, is trapped in a cistern (large hole) for a THIRD of the book. To me that was entirely too long for her to be trapped in a “gripping” thriller. For the same reason 127 Hours wasn’t as popular as it could have been with a man stuck between rocks for the whole movie, Ari stuck in a hole for a third of the book was equally boring. And not as inspiring. Another issue I had, was the killer was very cliche. In the beginning we’re not sure who the killer is, but we get a lot of their backstory, and it felt overused and a little fake. For example, the killer’s parents are extreme Christians and make the killer read the Bible, and provide whippings. OH AND THEY ALSO LIVE IN THE MIDDLE OF NOWHERE. And I don’t want to give anything away, but the killer has to do “some things” to get work, and there was never a moment where they were affected by it, or decided because of that, their victims were going to fit a certain profile. The killer reveal also wasn’t as satisfying as it could have been. You know when you find out who the killer is and then everything in the whole galaxy just clicks into place? There was none of that. Also, I may be stupid, but I didn’t understand the title. There’s a section that “explains” it, but after reading it several times, I still didn’t see why that specific phrase was chosen. A gritty and gory thriller aimed squarely at the teen market is a difficult thing to pull of, and in this case I don't think the author quite succeeds. Blood Will Out is the story of Ari, a teenage girl who wakes up to find herself alone and injured at the bottom of a cistern, with no idea how she got there. Determined to recover her memories and escape, she will carry out feats bordering on the super human. The big question is who put her there,and why? On a positive note I liked the characters A gritty and gory thriller aimed squarely at the teen market is a difficult thing to pull of, and in this case I don't think the author quite succeeds. On a positive note I liked the characters of Ari and her best friend Lynn, the relationship between them was fun and believable. However many of the other characters felt very clinched and there were a couple of far too obvious red herrings. I really didn't like Ari at first, and the book had random flashbacks in the middle of scenes, which was a little confusing. There were alternating chapters where we read the book from the perpetrator's perspective, and I didn't really like reading that because it was seemed to just exist for the sake of being gory. This review is based o I hated this book. The animal torture certainly contributed to this, but I do understand when it's in books about killers if it's used effectively. This was not. The descriptions seemed to become excessive and gratuitous. Then there were the pov switches. They felt awkwardly placed. Also, I normally don't question book designations too much, since they're subjective, but in no way is this meant for a young adult audience. Do not recommend. In fact, I wish I could unread it. Major warnings for animal abuse, torture, and slaughter. This feels more adult than YA, closer to true crime/serial killer stories. I'm ok with reading that, but I know a lot of people aren't. The premise is great -- a story told from the voice of the victim and that of the criminal -- but the execution is weak. The writing is dull, the voices don't sound at all authentic, and the twist made little to no sense. Go ahead and pass. There are much better thrillers out there. Okay, I have to admit, mystery isn't my favourite genre in the world. But, I have read many mysteries that I really liked. This book, sadly, wasn't one of them. It was written like a YA book, but the content was too mature at times to be a YA book. It also has to be said that, for a book published in 2018, it wasn't a very good example on how to bring mental health problems into a book. It wasn't the worst mental health representation I've ever read, but it was far from the best. So, don't read this if you get easily upset by books that go lightly over subjects like that. I skimmed the reviews of many people who didn't like this book before hand, so I noticed there were a lot of people who didn't like this book. I didn't really read why they didn't like it, because I wanted to give the book an honest chance. Honestly, the first half of the book actually wasn't that bad. I even thought I was an exception in this case who liked a book many others didn't like (that would definitely be a first for me). At times it really was a thriller and it was quite unique. But the second part was just so much worse and now I understand what all the others were talking about. It's just not scary, it's very predictable and overall not that interesting. There were two kinds of chapters in this book. First you had the chapters narrated by Ari, they were boring and by the end I was skimming them quite often. On the other hand there were the chapters that were narrated by the killer and they were just plain weird and nasty. I don't get Ari at all (or any of the other characters for that matter). In the first half of the book she still reacts kind of normal. She's scared has hell (who wouldn't be if they got kidnapped) and she's only focused on getting away and staying alive. Like I said, quite normal and interesting to read. But in the second half she goes all bonkers. She does things that make no sense and everybody reacts to her in the strangest ways. I don't know any human being who would react like that. So, the story didn't feel real and that made the story really boring. I think at times it was a bit too graphic for a YA novel, and I'm not someone who easily complains about that type of things. I think children don't need to be too protected and that they can handle more than some adults give them credit for, but this was just unnecessary. There are many animals being murdered in detail and I was okay with it the first time, because at that time it was only a short scene and a one time event, but the fifth time I was beginning to question how appropriate it still was for a YA novel. I'm actually quiet surprised to see a big publisher like Penguin Teen, bring out a book like this. Normally they have quite high standards and this really shouldn't have made their standard. Like many of the reviews are suggesting, this book is not for the light-hearted. This is one of the most gory and detailed stories I've ever read in my entire life. I normally would've given this award to Danielle Vega and her Merciless series, however, this book is certainly up there. If you cannot handle (I almost didn't) details about the abuse of both humans and animals, do not go for this, even though it was an i This review can also be found on A Thousand Lives Lived, check it out for more! Like many of the reviews are suggesting, this book is not for the light-hearted. This is one of the most gory and detailed stories I've ever read in my entire life. I normally would've given this award to Danielle Vega and her Merciless series, however, this book is certainly up there. If you cannot handle (I almost didn't) details about the abuse of both humans and animals, do not go for this, even though it was an interesting, suspenseful read full of plot twists I didn't see coming. I only really had one problem with the entire story, and that was the writing. But we'll get into that in a bit. Blood Will Out is about our main character, Ari, whose story is told in the third-person perspective. She is living a relatively normal life until she wakes up, trapped, underground. She does not recall what has happened, nor why she is stuck, and she tries to do whatever it takes to escape and try to save herself. No one hears her screams and pleads for help, however, and she believes that the killer is coming back for her to receive what they originally wanted. We readers get to read about her past, and the present, in addition to a mysterious first-person perspective, technically that of the killer. What entertained me the most in this novel was that first-person perspective. It obviously was the gory perspective, but it was interesting to get in the mind of the killer in this story. I've never read a book which showcases this kind of perspective before, so this was completely new and refreshing. Keep in mind that what you think you know about all the characters in this book is not the truth at all. At. All. Treggiari did an excellent job at convincing readers that they know the truth, keeping them interested to see if their predictions are correct. My predictions were so wrong. What I don't get is why there's so much negativity. I understand that the writing was kind of gross in some parts; the author attempted to use some descriptive writing that just didn't work. It really made me laugh out loud at some points. But aside from that (only a minor flaw), the book was fast-paced and full of suspense, allowing this to be categorized as a thriller and horror story. I've heard people say that this is like a Silence of the Lambs kind of read, and now I feel compelled to watch it to see if it's like this. Blood Will Out was such an interesting read and one of the most unique I've recently read. I cannot wait to see what else Jo Treggiari has in store for readers in the future. 3.5/5 stars – rounded up because it deserves better than the 2.7 it currently has. Trigger warnings for graphic descriptions of violence against animals and humans. Blood Will Out is a well-done mystery thriller that really will have you guessing until the end. The book is told in alternating perspectives – Ari in the well, Ari’s flashbacks to before her kidnapping/attempted murder, and the life story narrated by the killer. This gives you a lot of good angles from which to consider how and why Ar 3.5/5 stars – rounded up because it deserves better than the 2.7 it currently has. Blood Will Out is a well-done mystery thriller that really will have you guessing until the end. The book is told in alternating perspectives – Ari in the well, Ari’s flashbacks to before her kidnapping/attempted murder, and the life story narrated by the killer. This gives you a lot of good angles from which to consider how and why Ari is at the bottom of this cistern, left to die in the middle of the night. Ari does far more than despair at the bottom of the well – she makes it her mission to escape and find out who tried to kill her, and where they may strike next. That being said, the first part of the book did drag a little for me. The second half is where things really picked up and I got really invested. The actual twist of who is responsible for these crimes was very well done – I thought I had this figured out early, then had a few other theories, but was completely caught off-guard at the end. Really well done. One thing that got tedious for me was the multiple graphic depictions of the torture and butchery of animals. There’s one chapter in particular where it went on for a very long time, and it was difficult for me to read. I understand that the author wanted us to get into the mind of this killer and see how much joy they took from this violence, but if you struggle with those types of depictions, use caution when reading this book and skip ahead a couple of paragraphs if you need to. As you can tell, I didn’t enjoy this book, mainly for the reasons listed above. Let me start by saying that I don’t read thrillers – ever. I also consider my tolerance for blood to be pretty high and it doesn’t really both Going into this book, I was really excited. I was told that it had a similar vibe to Silence of the Lambs but in the form of a young adult book. What I wasn’t expecting was the mediocre writing, lack of plot, constant animal abuse/torture, and a disappointing reveal at the end. Writer, reader, and bookseller. My newest book, a YA psych thriller, is Blood Will Out (Penguin, 2018). My next book, another YA thriller, The Grey Sisters, will be published in 2019. I'm always working on the next thing.